You know what there’s not enough of in pop music? Albums about medieval bestiaries. These books described various animals and included pictures usually based on the descriptions, as the authors and illustrators often wouldn’t have seen the animal being described, along with a moral to go with it. They often included fantastic creatures like griffins and unicorns and other such impossible bodies, perhaps not necessarily because the author believed they existed, but because they thought the moral that went with the creature was an important one. 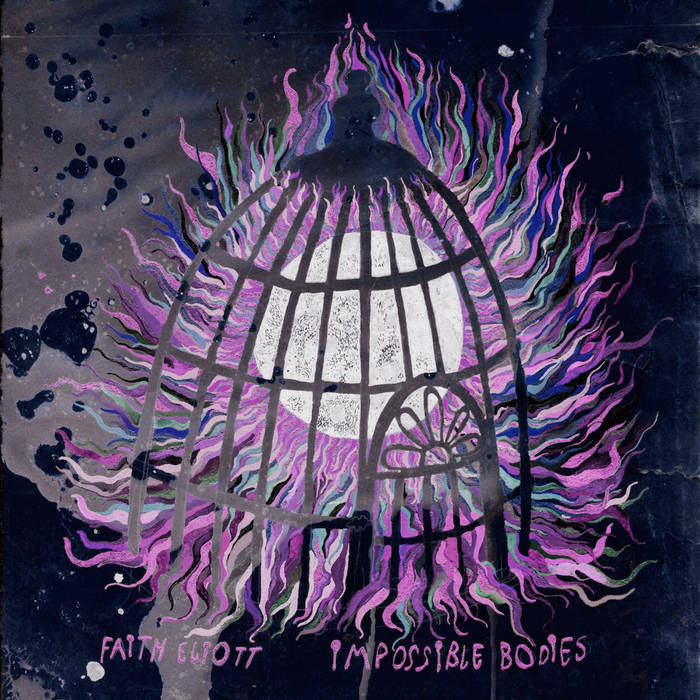 Faith Eliott‘s debut album Impossible Bodies is laid out in a similar way. Single ‘Lilith’ is about a python in a petting zoo. The spectral backing vocals swathe the lurching, overdriven guitar strum like “a coiled ghost in a plastic basin”. In Jewish folklore, Lilith was Adam’s first wife before Eve who was banished from the garden of Eden before becoming the snake who tempted Eve. Eliott plays with this mythology in the line “You and I both know that boredom is the true original sin” and goes on to turn it into a new metaphor for metamorphosis: “our time will come and we’ll shed our final skin and be free from these bodies we’ve been so long locked in/We’ll see that you were never a snake just as I am not a woman”. This brilliantly clever twist from ancient mythology to a more personal reflection on gender is very deliberate. Eliott explains “it’s a song about feeling captive in an identity, specifically as a woman but also more generally as a body”, while the album title refers to “the recurring theme of physicality in reference to gender, beauty… and the idea of transformation”. That idea of transformation is mirrored by the production of the record. Opener ‘Carl Sagan Cosmos Song’ is barely there, just vocals and gently strummed guitar reminiscent of early Laura Marling if she sang about geological epochs. It’s followed by the stunning lushness of ‘Loomis’, its rolling piano framed by the blooming, blossoming strings, a symphony in four minutes. The finest and most delicate moment on the album comes with ‘Laika’‘s icy synth chirrups and plucked guitar. It’s a paean to Andromeda and Cassiopeia, both figures in Greek mythology and constellations. Those duel references spin around each other as Eliott sings about their body being carried away from an “ocean as black as oil” by red giants into clouds of helium, until “the galaxy is quiet and pure below me”. It turns the story of the eponymous Soviet space dog, by turns a triumphant achievement of the first time a living thing was sent into space and tragic in that she was left there, into an equal with the great ancient Greek myths. And it does so in such a stunning, heartbreakingly understated way, over an ethereal folk backing that Enya would be proud of (it’s fine, Enya is cool now). As an artist, Eliott is nothing if not fascinating. Music isn’t their only outlet: this is the first release on their own OK Pal Records and they’re a busy visual artist. Hopefully this won’t distract from more music because Impossible Bodies is a wonderful curio of an album. Impossible Bodies is released on 19th April through OK Pal Records.